No special forms are required to submit a nomination. Consult the prior year’s published list to determine what information is needed. Send nominations to Christopher Patalinghug at tope@beardgroup.com and Topè will confirm receipt of your submission by return e-mail. You can also contact Peter A. Chapman at peter@beardgroup.com by e-mail or (215) 945-7000 by telephone. 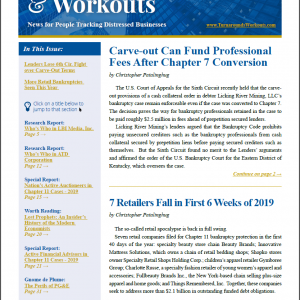 Active Auctioneers in Chapter 11 Cases — Data for this resource list is compiled by Troubled Company Reporter reporters and editors based on their reporting about the hiring of an auctioneer and their monitoring of court dockets in all active chapter 11 bankruptcy cases within the prior year. Active Financial Advisors in Chapter 11 Cases — Data for this resource list is compiled by Troubled Company Reporter reporters and editors based on their reporting and monitoring of court dockets in all active chapter 11 bankruptcy cases, based on the professional firm’s self-identification in employment and retention applications filed with bankruptcy courts within the prior year. This list does not include firms filling investment banking and turnaround management roles. Many of these superstars’ firms sponsor the annual Distressed Investing Conference hosted by Beard Group in Midtown Manhattan on the Monday following Thanksgiving Day and participate as faculty members at that important event. Restructuring Departments of European Accounting Firms — Information for this Special Report is obtained primarily from Troubled Company Reporter Europe reporters and editors, identifying European accounting firms hired within the past year by clients exhibiting signs of stress or restructuring their operations and finances. People to Watch — Business Professionals Making Their Mark — This highly competitive list identifies corporate restructuring professionals, distressed debt investors, service providers, members of the media, government officials, academics, and other individuals who may be lawyers but aren’t actively engaged in the practice of law. Nominations from corporate restructuring lawyers about non-legal professionals they’ve crossed paths with in the past year are encouraged. 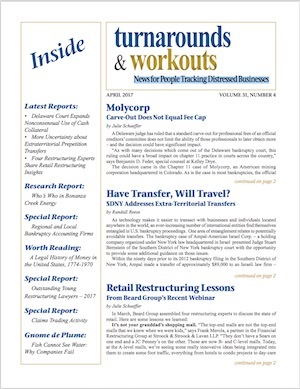 Regional and Local Bankruptcy Accounting Firms — Information for this Special Report is obtained primarily from Troubled Company Reporter reporters and editors, identifying accounting firms that, within the past year, have opined about one or more clients exhibiting signs of stress or have been employed or retained in a chapter 11 proceeding. Outstanding Young Restructuring Lawyers — This highly competitive list identifies a dozen corporate restructuring lawyers who are under 40 years of age, generally a partner, and have a list of outstanding achievements within the prior year that will make a reader say, “Wow!” Honorees are recognized at a reception the Monday following Thanksgiving Day at the annual Distressed Investing Conference hosted by Beard Group, Inc., in Midtown Manhattan, and, as Harvey Miller and Jack Butler each observed, become extraordinarily successful in the years that follow. 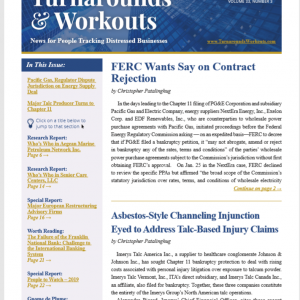 Major Trade Claim Purchasers — Information for this Special Report is derived from Troubled Company Reporter reporters and editors’ monitoring of court dockets in all active chapter 11 bankruptcy cases. Top Internet Bankruptcy Resources — Beard Group takes the opportunity once each year to recognize its competitors and their complimentary products that serve the corporate restructuring community. Bankruptcy Tax Specialists in the Nation’s Major Law Firms — This list identifies a small club of lawyers at large law firms whose practice is at the intersection of corporate restructuring and tax law. U.S. Turnaround and Restructuring Firms With European Offices — Information for this Special Report is obtained primarily from Troubled Company Reporter Europe reporters and editors, identifying turnaround firms based in America hired within the past year by European clients exhibiting signs of stress and restructuring their operations and finances. 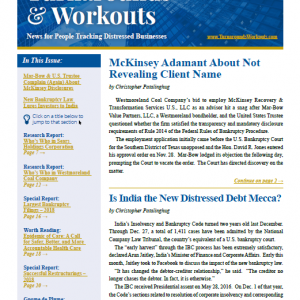 Nominations about current out-of-court workouts and engagements completed within the past 12 months are welcome. Canadian Bankruptcy Law Firms — This resource list identifies Canadian law firms representing parties-in-interest in corporate restructuring proceedings under the Companies’ Creditors Arrangement Act. Outstanding Investment Bankers — Information for this resource list is compiled by Troubled Company Reporter reporters and editors based on their reporting and monitoring of court dockets in all active chapter 11 bankruptcy cases, based on the professional firm’s self-identification in employment and retention applications filed with bankruptcy courts within the prior year. This list does not include firms filling financial advisory and turnaround management roles. T&W editors define an investment banker as a firm that typically arranges fresh capital for a client and opines about the value of new publicly traded securities issued under the terms of a confirmed chapter 11 plan. 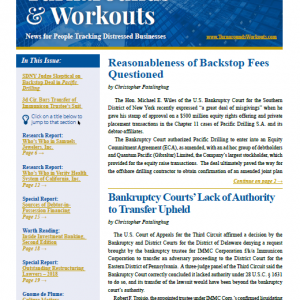 Nominations concerning out-of-court workouts completed in the past 18 months are welcome. Many of these firms sponsor the annual Distressed Investing Conference hosted by Beard Group in Midtown Manhattan on the Monday following Thanksgiving Day and participate as faculty members at that important event. Latin American Restructuring Practices of U.S. Law Firms — Information for this Special Report is obtained primarily from Troubled Company Reporter Latin America reporters and editors, identifying U.S. law firms with Latin American practices hired within the past year in cases involving Latin American companies exhibiting signs of stress or restructuring their operations and finances. Asia-Pacific Restructuring Practices of U.S. Law Firms — Information for this Special Report is obtained primarily from Troubled Company Reporter Asia-Pacific reporters and editors, identifying U.S. law firms with Asia-Pacific practices hired within the past year in cases involving Asia-Pacific companies exhibiting signs of stress or restructuring their operations and finances. Restructuring Departments of National Accounting Firms — Information for this Special Report is obtained primarily from Troubled Company Reporter reporters and editors, identifying pan-American accounting firms that, within the past year, have opined about one or more clients exhibiting signs of stress or have been employed or retained in a chapter 11 proceeding within the past year. European Restructuring Practices of U.S. Law Firms — Data for this Special Report is obtained primarily from Troubled Company Reporter Europe reporters and editors, identifying U.S. law firms with European practices hired within the past year in cases involving European companies exhibiting signs of stress or restructuring their operations and finances. Major Chapter 11 Cases by Industry Sector — This annual list is prepared by Troubled Company Prospector editors. Nation’s Largest Claims Administrators — Information for this Special Report is derived from Troubled Company Reporter reporters and editors’ monitoring of court dockets in all active chapter 11 bankruptcy cases. Outstanding Turnaround Firms — This annual list shines the spotlight on the people and firms that provide on-site management and make the hard day-to-day business decisions at troubled and bankrupt firms. Nominations about on-going and recently completed out-of-court workouts are welcome. Sources of Debtor-in-Possession Financing — This resource list is compiled by Troubled Company Reporter reporters and editors based on their reporting and monitoring of court dockets in all active chapter 11 bankruptcy cases, based on the filing of motions for approval of post-petition borrowing by a chapter 11 debtor pursuant to § 364 of the U.S. Bankruptcy Code. Outstanding Restructuring Lawyers — This highly competitive list identifies fifteen or fewer corporate restructuring lawyers who are unquestionably sleep deprived and within the prior year have a list of achievements that make any reader say, “Wow!” Many of these superstars’ firms sponsor the annual Distressed Investing Conference hosted by Beard Group in Midtown Manhattan on the Monday following Thanksgiving Day and participate as faculty members at that important event. Largest Chapter 11s — This annual list is prepared by Troubled Company Prospector editors. Successful Restructurings — This annual list tells the stories where corporate restructuring professionals worked together in the past year to restructure businesses, continue business operations, save jobs, and pay creditors. 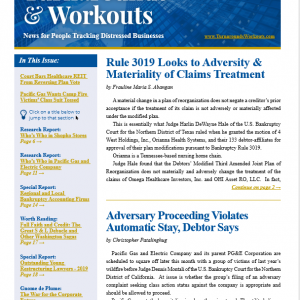 Nominations about out-of-court workouts and receivership proceedings are always welcome.